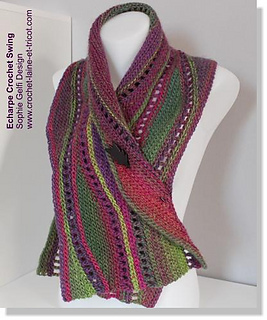 Use Variegated DK yarn with long color changes. 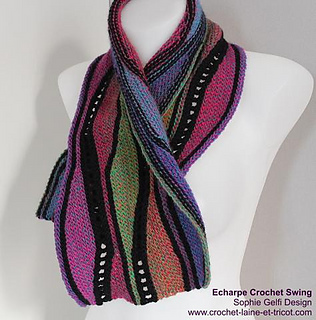 You can knit or crochet this pattern, instructions and chart are for both technics. For a long time i’ve been searching for a way to make swing knitting easily and quickly and even replace needles with a crochet hook as crochet is my preferred technique. Everything i read about swing knitting was too complicated for me and i don’t like to use a lot of stitch markers on my work. After a lot of attempts i finally found a method that permits me to reach the desired result much more easily. 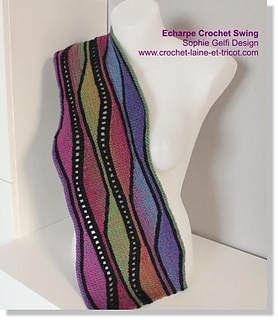 Explications du modèle écharpe SWING réalisable au crochet et/ou au tricot en format pdf.